The latest release of the IdentityMind platform, version 1.36, is out. 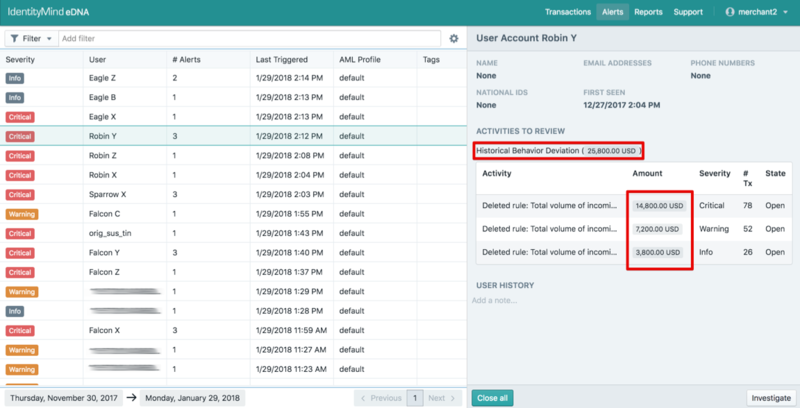 This release strengthens verification capabilities for merchant onboarding, allows more granular geographic blocking and continues to build the AML UI. Because a good transaction monitoring platform helps analysts manage the volume and complexity of transactions associated with AML Transaction Monitoring processes, we are continuously optimizing the UI to give analysts the tools and information they need to catch suspicious cases early. This makes it easier to see the distribution of exposure against each category. Beyond collecting identifying information, we facilitate KYC by gathering and analyzing over 50 attributes per entity. Building identities in this way lets our clients see linkages and perform a wider range of checks, meaning they can tune the platform to their particular risk tolerance levels and implement a risk-based AML strategy. We now provide the ability to check whether a provided TIN (taxpayer identification number) or EIN (employer identification number) has been issued. This provides extra information with which a client can assess the risk associated with US merchants. On occasion, an SSN will be entered in the TIN field instead. The platform will look up the name and number provided, and confirm whether a match was found in the IRS SSN records. Clients can then follow up with their customers to clarify. In the US and Canada, clients can accept or deny geographies at a regional level. A new security test compares a user’s IP address against a list of acceptable regions, giving clients greater control of where they want to accept business from. These features are available now to customers using our AML and KYC capabilities.If you are a customer and have questions about these features, please contact the support team here. If you are interested in these features, contact the demo team to get started.